FEATURED IN: Decontaminating Soil Using Bioremediation Featured in MechChem Magazine! FEATURED IN: Bacteria/Chemicals - Grease - Bionetix International BIOBLOC22 Featured in Pumper Magazine! FEATURED IN: Bio/Enzyme Additives - Bionetix International BIOBOOST Tablet 1T Featured in Onsite Installer Magazine! FEATURED IN: Odor Control - Bionetix International Eco-Scent Featured in Pumper Magazine! FEATURED IN: Bionetix® International Introduces Natural and Economical Approach to Enhancing Water Clarity Featured in Process Industry Magazine! 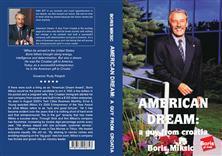 FEATURED IN: Pollution-Fighting Bioaugmentation Treatment Featured in World Fishing Magazine! FEATURED IN: Bionetix® International Introduces Natural and Economical Approach to Enhancing Water Clarity Featured in Water Magazine! FEATURED IN: Bionetix® International Introduces Natural and Economical Approach to Enhancing Water Clarity Featured in IPW Magazine! FEATURED IN: Bionetix® International Introduces Natural and Economical Approach to Enhancing Water Clarity Featured in Aquaculture Magazine! FEATURED IN: Bionetix® International Introduces Natural and Economical Approach to Enhancing Water Clarity Featured in Informed Infrastructure Magazine! FEATURED IN: Bionetix® International Introduces Natural and Economical Approach to Enhancing Water Clarity Featured in Waste Water Magazine! FEATURED IN: Bionetix International PORTA-TREAT Featured in Pumper Magazine! PRODUCT RELEASE: Bionetix® International Introduces Natural and Economical Approach to Enhancing Water Clarity! FEATURED IN: Bionetix International AeroBooster-O2 Biostimulator Featured in TPO Magazine! FEATURED IN: Bionetix Introduces New Biostimulation Product for Wastewater Featured in Crown Publications! 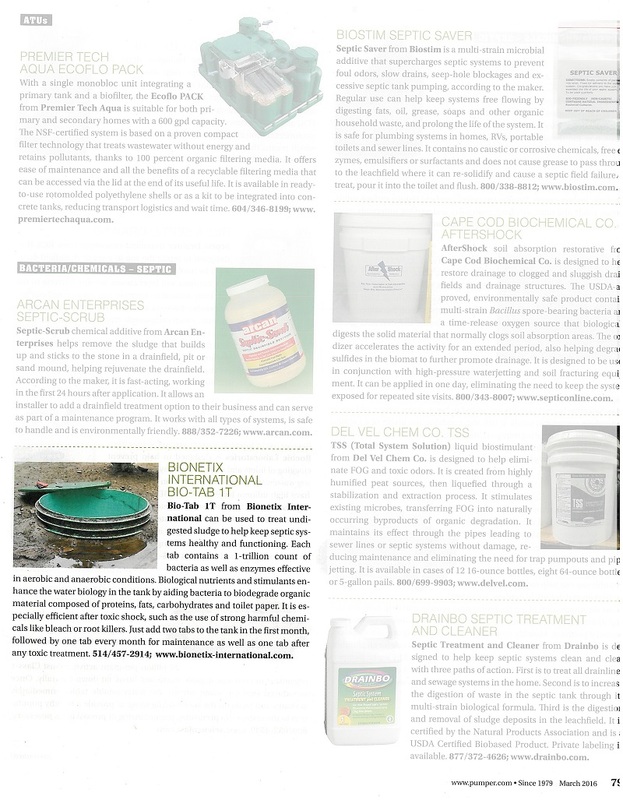 FEATURED IN: Sludge Treatment - Bionetix International BIOBOOST Tablet 1T Featured in Pumper Magazine! NEWS ALERT: Bionetix® International Successfully Passes ISO 9001:2015 Quality Management System Transition Audit! FEATURED IN: Bionetix International Porta-Treat P Plus Deodorizer and Cleaner Featured in Pumper Magazine! FEATURED IN: Distillation/Floridation Equipment and Microbiological Control - Bionetix International HYGIEA 2200 FF 10X Featured in TPO Magazine! FEATURED IN: Odor Control - Bionetix International Porta-Treat Featured in Pro Magazine! PRODUCT RELEASE: Bionetix® Improves Portable Toilet Appearance, Odor, and Ease of Pumping with Bluer, More Fragrant Natural Treatment! FEATURED IN: Bionetix International Fizzy-Tab Featured in Pumper Magazine! FEATURED IN: Bioremediation Product Successfully Used for Environmentally Safe Treatment of Refinery and Chemical Waste Featured in Lab Magazine! FEATURED IN: Bionetix International BIOBOOST Tablet 1T Featured in Onsite Installer Magazine! FEATURED IN: BCP12 Featured in Pollution Equipment Magazine! FEATURED IN: Anaerobic Digestion Featured in Pollution Equipment News! FEATURED IN: Bionetix International Eco-Scent Featured in Portable Restroom Operator Magazine! FEATURED IN: Bionetix International Macro N/P Biostimulant Featured in TPO Magazine! FEATURED IN: Major Expansion and Leading Edge Recycling Program for World's Largest VpCI Film Extrusion Plant Featured in Plastics Today Magazine! FEATURED IN: Sludge Treatment - Bionetix International Fizzy-Tab Featured in Pumper Magazine! PRESS RELEASE: Bionetix® Provides All-Natural Feed Additive to Boost Health of Aquatic Species! FEATURED IN: Taking the Natural Route for VOC Abatement and Waste Treatment Featured in Pollution Equipment News! 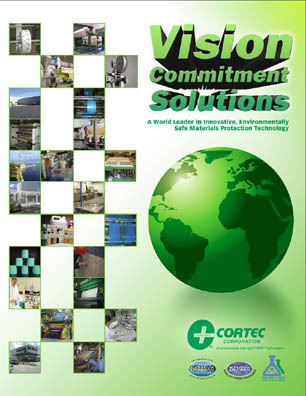 NEWS ALERT: Important Industry Magazine Recognizes Cortec’s Commitment to Discovering Natural Solutions! FEATURED IN: Organic Plus SP Controls Zoospores Featured in World Bio Fuel Digest Magazine! FEATURED IN: Organic Plus SP Controls Zoospores Featured in World Fertilizer Magazine! PRESS RELEASE: MCI® Technology Preserving War - Destructed Monument and Symbol of Croatian Independence! PRESS RELEASE: Bionetix® International Provides Natural Solutions to the Growing Aquaculture Industry! PRODUCT RELEASE: Bionetix® All-Natural Plant Bio-Stimulant and Soil Microbial Enhancer Has Potential to Boost Crop Health! FEATURED IN: Bionetix Biosurfactant Treatment Naturally Cleans Oil Spills Featured in IMD Magazine! PRODUCT RELEASE: Bionetix® EN-Z-KLEAN: A Safe and Natural Choice For Greasy Stain Removal! FEATURED IN: Bionetix BioSurf Using Nature to Clean Oil Spills on its Own Surf and Turf Featured in Coatings World Magazine! FEATURED IN: Using Nature to Clean Oil Spills on its Own Surf and Turf Featured in IPF Magazine! FEATURED IN: Bionetix® Biosurf Uses Nature to Clean Oil Spills on its Own Surf and Turf Featured in AZO Materials Magazine! NEWS ALERT: Bionetix® International Celebrates 20th Anniversary of Providing Natural Bioremediation Solutions! PRODUCT RELEASE: Bionetix® Biosurf Uses Nature to Clean Oil Spills on its Own Surf and Turf! PRODUCT RELEASE: Bionetix&REG; ENZA 4EP: Superior Multi-Purpose Cleaning, Waste Treatment, and Remediation with Enzymes! FEATURED IN: Coagulants/Flocculants - Bionetix International Micro 14 Featured in TPO Magazine! FEATURED IN: Bionetix Odor Eliminator Featured in Recycling Product News! FEATURED IN: Bioremediation: A Natural Way to Capture the Ambient Odors of Truck and Triage Featured in Waste Advantage Magazine! FEATURED IN: Multiple Benefits from All Natural Feed Additive for Aquaculture Industry Featured in Processing Industry Magazine! FEATURED IN: Bionetix International Bio-Tab 1T Featured in March Pumper Magazine! FEATURED IN: Bioremediation Product Successfully Used for Environmentally Safe Treatment Featured in Pollution Solutions Magazine! FEATURED IN: New Bio-Based Concentrates or Waste Treatment Launched Featured in Chemical Technology Magazine! FEATURED IN: Bionetix Unveils New Eco-Friendly Concentrates Featured in MEA Magazine! FEATURED IN: ABC Concentrates - Missing Link Between Environmental Protection and Effective Treatment Featured in Packaging Europe Magazine! FEATURED IN: Bionetix Unveils New Eco-Friendly Concentrates Featured in Trade Arabia Magazine! PRESS RELEASE: ABC Concentrates - Missing Link Between Environmental Protection and Effective Treatment! 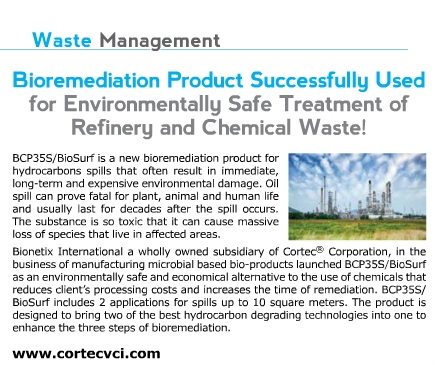 FEATURED IN: BCP35S/BioSurf Featured in Waste Management Magazine! NEWS ALERT: Bionetix Celebrates 2nd Bi-Annual World Sales Meeting! NEWS ALERT: Pollution Equipment News Features Three Cortec&reg; Articles in August/September Issue! 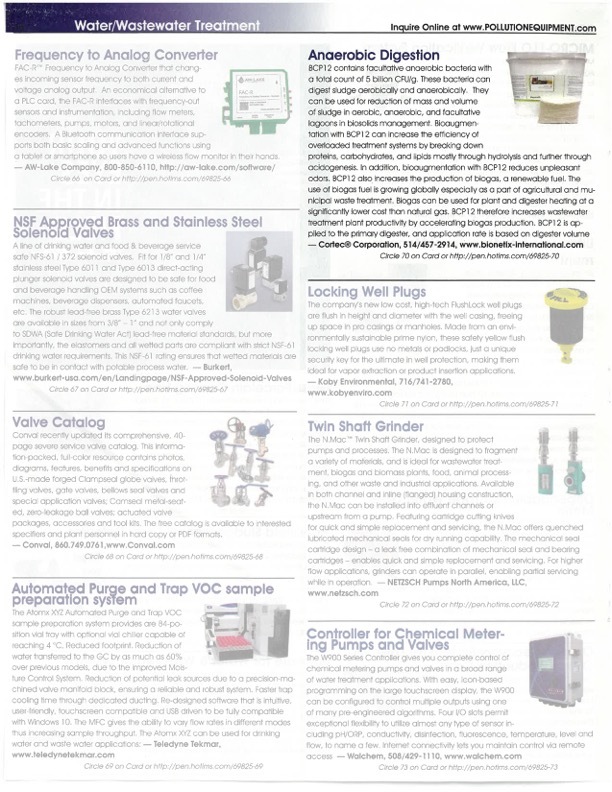 FEATURED IN: BCP35S/BioSurf Featured in Pollution Equipment Magazine! FEATURED IN: New Micronutrient Blend Featured in Mining Weekly Magazine! FEATURED IN: BCP35S/BioSurf Featured in Pollution Solutions Magazine! PRESS RELEASE: Bionetix®Bioaugmentation Products: Preparing The Industry For Season Changes! FEATURED IN: Spill Kit 35S Featured in Pollution Equipment Magazine! FEATURED IN: Bioremediation Product Treats Hydrocarbon Spills Featured in Sustainable Manufacturing Magazine! FEATURED IN: Bioremediation Product Successfully Used for Environmentally Safe Treatment Featured in Energy Management Magazine! FEATURED IN: Bioremediation Product Successfully Used for Environmentally Safe Treatment Featured in New Technology Magazine! PRESS RELEASE: Bioremediation Product Successfully Used for Environmentally Safe Treatment of Refinery and Chemical Waste! FEATURED IN: Microbiological Control - Bionetix International BCP85 Compost Accelerator Featured in TPO Magazine! PRESS RELEASE: Multiple Benefits From All Natural Feed Additive for Aquaculture Industry! FEATURED IN: New Micronutrient Blend Featured in Water World Magazine! FEATURED IN: La bioaumentación o los bichos que limpian el agua Featured in El Mercurio Magazine! FEATURED IN: New Micronutrient Blend for Superior Soil Featured in Water Online Magazine! FEATURED IN: New Micronutrient Blend for Superior Soil Featured in Energy Management Magazine! FEATURED IN: New Micronutrient Blend for Superior Soil Featured in Engineering News Magazine! PRESS RELEASE: New Micronutrient Blend for Superior Soil and Wastewater Bioremediation! PRESS RELEASE: Bionetix® ECP 57 – Enzyme Blend for Complex Grains and Woody Material Breakdown! FEATURED IN: Bionetix Spill Kit 35S Featured in Public Works! FEATURED IN: A Better Treatment for Oil Spills Featured in FM Magazine! FEATURED IN: A Bioremediation Product for Hydrocarbons Spills Featured in PCN Europe Magazine! FEATURED IN: A Bioremediation Product for Hydrocarbons Spills Featured in Plant Engineering Magazine! FEATURED IN: Reduce Your Processing Costs and Increase the Time of Remediation! PRESS RELEASE: Reduce Your Processing Costs and Increase the Time of Remediation! Rational and Safe Crop Management! NEWS ALERT: Bionetix 1st World Sales Meeting Huge Success! Bionetix International Announces BCP 85 For Acceleration And Optimization Of Compost Degradation! Latest Technology for Biological Waste Treatment, Bionetix International - Presents its New Improved Product Lines !